(NaturalNews) In the U.S., an estimated $32 billion per year is being spent unnecessarily to treat high blood pressure, the most common reason patients visit their doctor, scientists say. That $32 billion a year corresponds to more than 1 percent of annual healthcare costs in the U.S., and more than a third of the country's total expenditures. Not only is that figure wasteful, but instead of ensuring good health, the funds are contributing to treatment that's actually detrimental to the health of patients. A whopping 40 percent of adults suffer from high blood pressure, or hypertension, a condition that can lead to serious injury and death. Often referred to as the "silent killer," hypertension is particularly dangerous because of its symptomless nature. When left untreated, high blood pressure can initiate multiple complications, many of which are serious in nature, including kidney damage, stroke, vision loss, fluid in the lungs, heart damage and many more. While critical, of the 40 percent of adults diagnosed with hypertension, more than half the cases are considered "mild," which experts say should be treated differently from the high-risk cases. In a study recently featured by The BMJ, Dr. Stephen Martin and his colleagues warn about the risks of overtreating hypertension, stating that the "strategy is failing patients and wasting healthcare resources." Researchers are urgently recommending that doctors lower the drug threshold for which they prescribe blood pressure medication to patients, according to The BMJ. 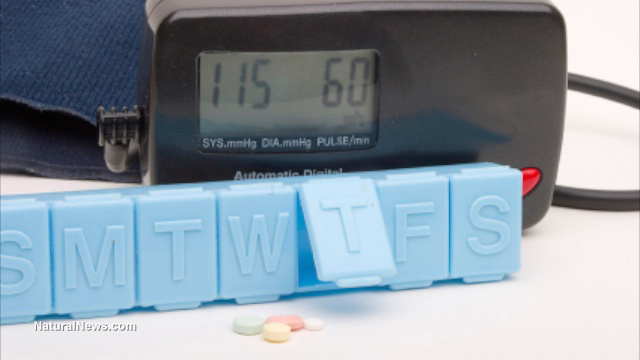 It was previously thought that prescribing blood pressure meds to low-risk patients with mild hypertension would improve cardiovascular health; however, today researchers argue that the drugs haven't been proven to reduce heart disease or death. In fact, low-risk patients who receive blood pressure medication may suffer unnecessarily from an array of side effects caused by the drugs. As with any chemically formulated pharmaceutical, side effects usually occur and can range from simply annoying to debilitating. Diuretics, also known as water pills, are usually the first line of treatment for high blood pressure and work by helping the body eliminate salt and water through the urine, according to Newport Natural Health. During this process, crucial minerals are often expelled from the body, particularly potassium, which has been proven to help prevent strokes. Other side effects include kidney damage, digestive disorders, vision loss, anxiety and bad cholesterol, among others. In addition to uncertainty over the drug's effect on mild hypertension patients, experts worry that overtreatment could lead to missed "opportunities to modify individual lifestyle choices and tackle lifestyle factors at a public health level." The study authors urge clinicians to share this uncertainty with low-risk hypertension patients and "encourage lifestyle changes to treat hypertension, including weight loss, smoking cessation, decreased alcohol consumption and increased exercise." There are many other ways to lower your blood pressure naturally. Research shows that weight gain is directly correlated with increased blood pressure, especially if you're carrying extra pounds around the waist. Exercising daily, and even losing just 10 pounds, can help reduce hypertension, according to the Mayo Clinic. Restricting the amount of alcohol that you drink can also play a role. Limiting yourself to just one drink a day can actually lower blood pressure, but anything more than that can raise levels and inhibit what effectiveness hypertension medication might have. Diet is equally as important. Reducing your sodium intake and focusing on foods such as fresh garlic, hot chilies, turmeric and cacao will contribute to maintaining normal blood pressure levels, according to a report by Natural News.